Lamb Cutlets with Walnut, herb and goat’s cheese salad: two racks of lamb cut into individual cutlets; small handful of thyme and even smaller handful of rosemary all chopped finely, 4 crushed garlic cloves and some olive oil for the marinade; 125ml of orange juice, 60 ml of red wine vinegar, 50g of honey, 1 star anise and 1 cinnamon stick for the sauce; 50g walnuts, some Dorstone (which is an amazing cheese) or other goat’s cheese cut into cubes, big handful of mint and the same of parsley, couple of lettuce leaves if you have some. Crush all the marinade ingredients together in a pestle and mortar, add enough olive oil to keep it loose and enable you to spread it all over the cutlets – add salt and pepper. Put cutlets smeared with marinade in a tuperware box or bag and let it sit in the fridge for a few hours or over night. For the sauce put all the ingredients in a saucepan, bring to the boil and simmer until reduced quite a bit – but not so much it becomes a very sticky sauce as I did – if this happens you can add a splash more orange juice to loosen it up. To make the salad toast the walnuts in a dry frying pan. 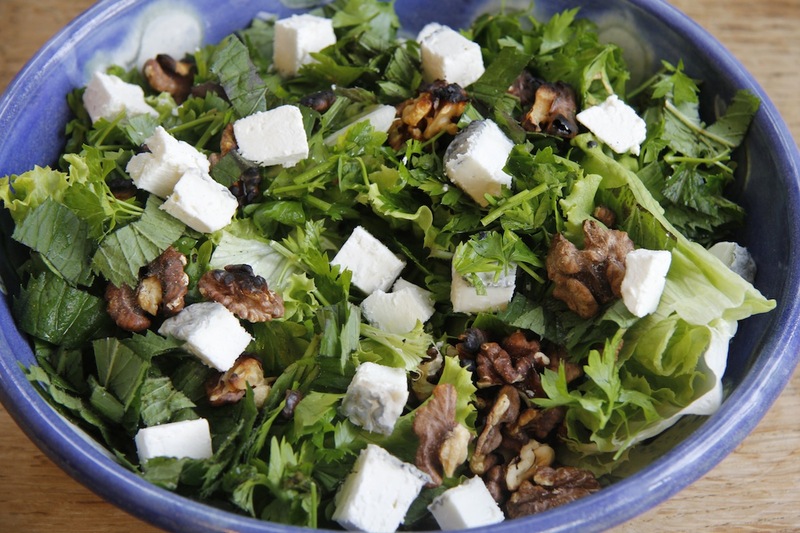 Tear up the herbs and leaves and pop in a bowl, sprinkle over walnuts and cheese. 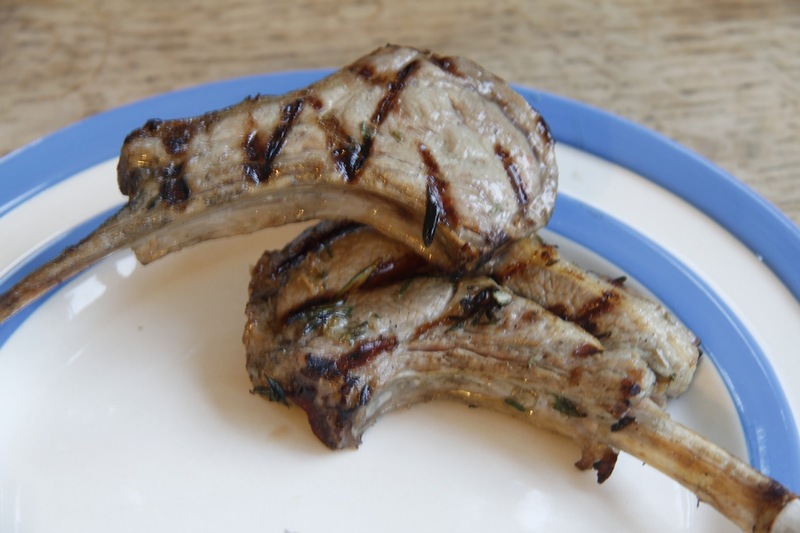 I then bbq’ed our lamb – first use of the bbq this year. I cooked them very briefly on both sides as I like things pink. To serve put a few cutlets on each plate with a spoonful of sauce and then drizzle the rest of the sauce over the salad. I served it with home made pita bread. The sauce went really well with both the salad and the cutlets – it was delicious. I only cooked half the cutlets – I left the rest for the next night and we had them with cacik which is essentially yoghurt with a dash of white wine vinegar, salt and pepper, a little olive oil and finely chopped cucumber added – you can add garlic too, but I was feeling too lazy. We had this with the rest of the cutlets, some lettuce and leftover pita bread. Depending how greedy you are I would say anything between 2-4 cutlets is about right. 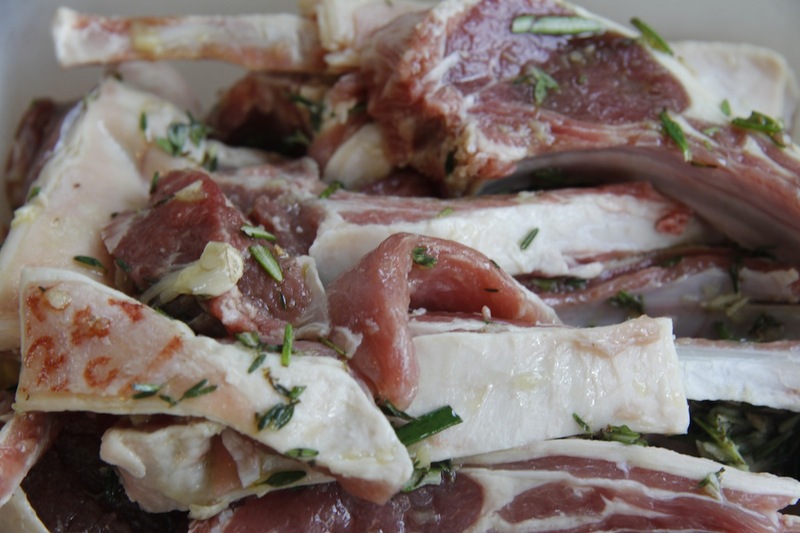 Lamb stew in winter is delicious – in the summer I prefer kebabs as they seem a bit lighter – not sure why! Thank you – it was pretty good.